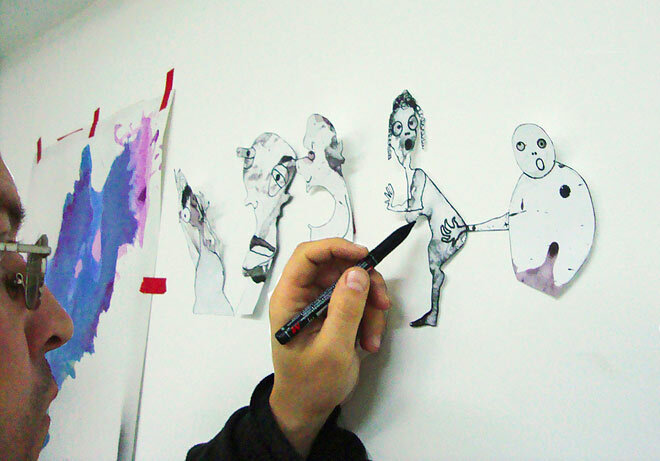 Works created during his creative residency in Barcelona. Reflections on the situation in Tunisia. JISER Reflexions Mediterrànies is an association created in 2005 by a group of young people from Spain and Tunisia who share ideals and values, and want to contribute to the transformation of the social realities they live in through art and research. Since its foundation, JISER Reflexions Mediterrànies has carried out several activities focused on cultural, artistic, and scientific cooperation with different Mediterranean countries. Their aim is to promote mobility and dialogue, as well as cultural production and dissemination in this space of intercultural confluences. This is why the association’s name is JISER, which in Arabic means bridge, a bridge between the two shores of the Mediterranean. JISER firmly believes that knowing others means understanding and knowing yourself. With the Creative Residency TNS>BCN project, JISER intends to develop a network of young visual artists, associations and art centers in the Mediterranean. The process began with the selection of two art projects to be carried out in the cities of Tunis and Barcelona, culminating with the exhibition of the works and the publishing of individual catalogues. For this first edition, only one artist from each city was selected. The first part of the project took part in Tunis, between April and June 2010, and Miquel Wert, from Barcelona, was the chosen artist. The second part of the project is taking place now, with the residency of Tunisian artist Mohamed Ben Soltane, who’s been in Barcelona since November 2010 and will stay there until February 2011. During this time, the artist has had the JISER atelier and the Centre Cívic Fort Pienc workshops at his disposal to develop his projects and works, which are now being exhibited at the centre until 12 February 2011. Mohamed Ben Soltane (Sidi Bou Saïd, Tunis, 1977) is one of the most promising artists of the contemporary art scene in Tunisia. Trained at the Institut Supérieur des Beaux-Arts de Tunis, he uses drawing, photography, video and installations in his works. He has exhibited individually and collectively in the most important galleries and art centers in Tunis. In 2006, he won the first prize in the ATBChallenge contest for young artists, organized by the Arab Tunisian Bank. Internationally, he participated in Algiers’ first contemporary art festival in 2010, and in the mediterránea(s) group exhibition at the La Panera Art Center, Lleida (Spain), in 2008. His residency in Barcelona has made the artist not only reconcile himself with painting, a technique he had abandoned to focus on his installations, but also develop it significantly. The exhibition shows this clearly: sixteen paintings in which we can see comical, sensual, monstrous characters that point to an intimate and personal imaginaire in which we recognize the influence of the city of Barcelona. This is the case in his work Chiens de Barcelone (2010), where we see a series of characters walking their dogs, who end up mimetically resembling each other. The development of these paintings converges on a comic strip with the work The Artist and the Immigrant, of June 2010. It’s a series of satirical cartoons denouncing the stereotyped vision European cultural institutions in Tunis sometimes have in their art projects selection processes, where themes are ethnocentrically established by the institution (the status of women, the veil, war, and so on). This comic strip directly refers to selective immigration, and its main character, Oussema –like Mohamed Bouazizi, who burnt himself to death in Sidi Bouzid on December 17th– is a produce street vendor without a permit. As if they were omens, Mohamed Ben Soltane’s works exhibited in Barcelona speak of the historical moment his country is going through. They are testimonial metaphors of a time of change, in which the old regime is collapsing giving way to the creation of a new space of freedom, democracy and equality, in which young people and society become decisive actors in this social transformation process. The work Rags, 2009, is a good example of the artist’s social commitment, denouncing the lack of freedom of press in Tunisia, which is influenced and controlled by the government. Crushed newspapers put over black ink buckets perfectly symbolize the lack of clarity of the press in this country. As the artist says: "You can wring out the Tunisian press and water won’t come out." Lastly, it is worth mentioning the collective project developed by Mohamed Ben Soltane in the IHEC de Carthage, an expression of participative art whose protagonists were young university students. The copy machine, located at the main entrance, captured more than 300 images, where faces, expressions, hands, arms, show the combination of hope, naivety and daring of the Tunisian youth. Mohamed Ben Soltane’s work tries to bring awareness to society, so that audiences are not mere observers but feel the crucial moment the artist, and the whole people of Tunisia, are going through. "I think what’s happening in Tunisia deserves respect. People have taken to the streets spontaneously and peacefully, with legitimate demands. What Tunisians want is the law to be observed, by everybody with no exceptions. They want a better distribution of the national wealth, so that it reaches every citizen. They want independent justice, a free press, uncensored access to the Internet, and above all, they want work." (Mohamed Ben Soltane, 12.01.2011). Founder and director of JISER Reflexions Mediterrànies. Assistant director of Fundació Suñol. Lives in Barcelona, Spain.